i've decided to bite the bullet & actually start a fashion blog. to the conclusion that it's at least an alright idea. 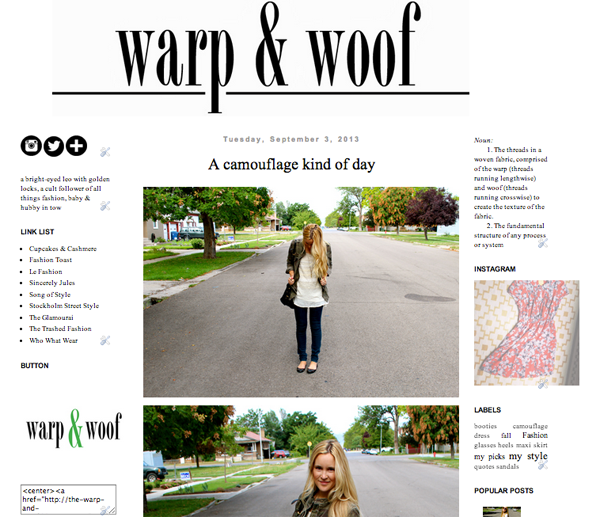 the blog is named warp & woof. different stores, & will soon have guest spotlights on others fashion. & what it means. warp & woof is a sewing term. the definition is: 1. the threads in a woven fabric, combined of the warp (threads running lengthwise) and woof (threads running crosswise) to create the texture of the fabric. 2. the fundamental structure of any process or system. & it stuck in my head. i liked the way it sounded & i like the definition. & that is how the name came to be. check it out & give me some feed back! okaaay loving the name/that you are doing this! !